Devine Ozigbo has gotten on the field lately because of his work ethic in practice, but it’s his improved all-around game that has kept him there and made him effective. The junior tailback was on the pine for the first two games of the season, and got two carries in week three. But Ozigbo has been released in the last two weeks and allowed to carry the backfield. He’s produced in a major way. A career-high 24 carries against Rutgers on Sep. 23 and a career-high 106 yards against Illinois on Sep. 29. Stretch the yardage he’s gained in the last two weeks over the Huskers' entire season to this point and Ozigbo is half a yard behind Wisconsin’s freshman sensation Jonathan Taylor for third in the Big Ten in yardage. In his last seven quarters of work (he didn’t log a play in the first quarter of the Rutgers game), Ozigbo has seven explosive run plays including two that have gone for 20 yards. Ozigbo said his play on the field has been a direct result of his work off the field. Before the season started, he wanted to work on his patience. 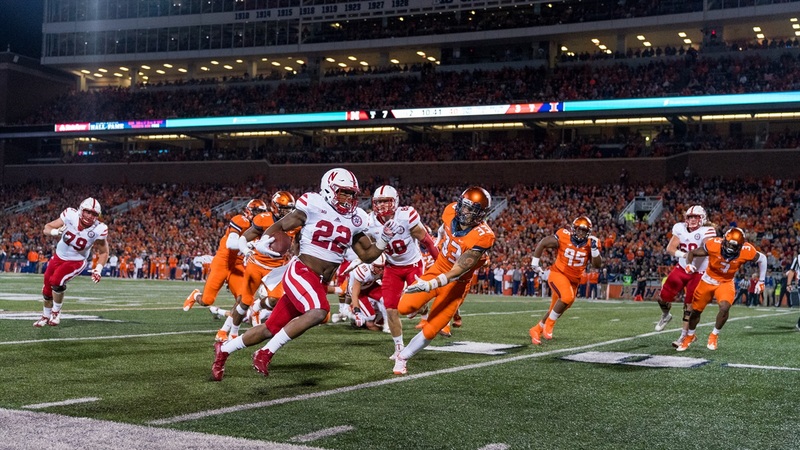 His coaches – offensive coordinator Danny Langsdorf and running backs coach Reggie Davis – have said Ozigbo used to be more of an east-west runner. Now, he’s waiting for blocks to develop and hitting his holes. No more bouncing everything outside. One of the biggest knocks on Ozigbo’s game in the past – and the presumed reason for his lack of playing time early this season – has been his effectiveness in pass protection situations. In the last two weeks, Ozigbo has been solid in that area. Quarterback Tanner Lee has only been sacked twice in the last two weeks and the overall pressure he’s faced has gone down a bit. Yes competition and an improving offensive line is a major factor, but the work Ozigbo has done shouldn’t be overlooked. Ozigbo said it’s not really an issue anymore. Now he just has to worry about referees telling him to pull his jersey down.